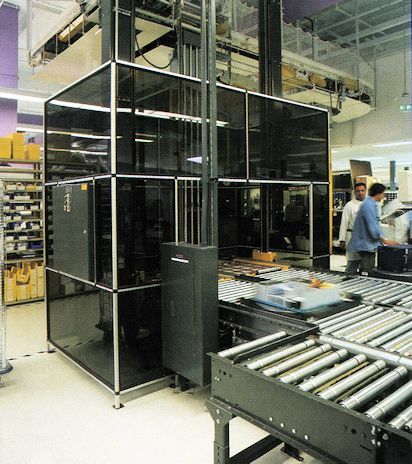 To maintain high output with their increasing growth was important at Silicon Graphics but one of the requirements here was to maintain a high degree of flexibility during the automation process. Silicon Graphics produces a large variety of high-end and low-end computers. All of these had to be produced in the same system. The system also had to be able to adapt quickly to new models. It's interesting to note that prior to this the low-end and high-end units were produced in separate buildings totaling 165,000 square feet. Now the two are combined in the 100,000 sq. ft. low-end building and they are doing three times the number of boxes as before. According to Jim Mullen at Silicon Graphics, "We used to be a very labor intensive organization and there was a lot of manual handling. 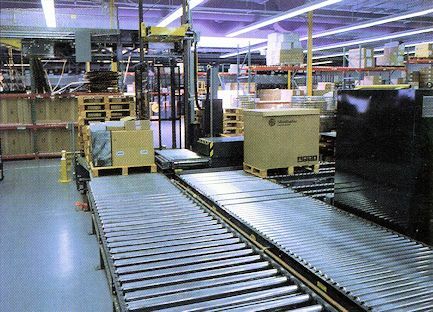 One of the advantages that we came across when we decided to go with a conveyor system was reducing the amount of handling that the people actually did. This was helpful for a couple of reasons. One was that the boxes were getting heavier so we had safety concerns with the employees lifting the boxes many times. Over a period of a day they may lift 100 to 200 systems and sometimes they weigh 40 lbs. each. The other thing was we needed some type of automation because of the amount of information we had to handle. A third thing was, we knew we were going to increase our production by 3 times. Also, it's the way of the future and we wanted to go with it." 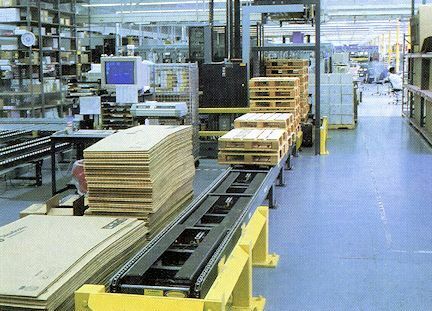 "Before the system, the boxes would come along to a certain point on the conveyor line and the people would have to physically pick it up and move it or we had a crane pick them up. Then they would go to a test station and testing. Everything was done manually. They would put it back on the line and move to the next place to do a burn-in. This could be 10 to 48 hours. Then it would come out and it would go to the quality control station. By going to the conveyor system we eliminated ever having to take the unit off the conveyor because one of the things we incorporated in this system was a special power pallet. So the unit on the pallet has its own power connector and it just snaps in every test station along the line." "Working with our subcontractor, we had to develop solutions to the things we wanted to accomplish. One was, we wanted to get the conveyor line off the floor because of the traffic flow. Another thing was the test stations are all modular. I can take one and move it to another line. The third thing we did, was make sure that there was enough flexibility in the line itself so we could reconfigure the line anytime we wanted to. One of the reasons that we really need that and we paid a small premium for it was because the cycle of our products is really short. Marketing tells us that they want something, engineering says yes we can do it, manufacturing gets a hold of it in a very short period of time." "When we had the old system we were maxed out at close to 100 - 150 units a day. Now we max out at about 400 units a day, between the three product lines that we have. When we add a fourth product line we feel we can still increase it. The year before we put the conveyor in our sales were about 700 million and the year just concluding sales are over one billion. The conveyor line didn't cost me that much. Very good return on investment." Jim said that FloStor was involved from the beginning of this project and helped from concept to completion. Their previous systems, also done by FloStor, worked well and did what it was supposed to without any problems. That is why they had FloStor do this one. This project originally started with six system ideas, some being more complex and less flexible than the final result. All the ideas, however, included much conveyor. After doing some simulation, they finally agreed on the current system which uses proven technologies. The project, incidentally, was completed in less than six months with no lost production. "We showed upper management that this was the system that we needed and they asked some very important questions like how long is it going to be here, when is it going to be obsolete, things like that. We had good answers that allowed them to let us go with it. It's been in operation for approximately one year. We bought it in phases. One line came up and we worked out the bugs. Then the second line and so on. When we got the whole system going it worked really well. We had some really good subcontractors, FloStor was one of the biggest. The control software was done by Serra Systems. We made sure the systems would run on a Silicon Graphics machine so we are not worried about the reliability of it. I really like it. It does its job well and given routine maintenance it pretty well works. Most of the problems that we've found have been operator errors and sometimes we get a little dust on the eyes. Other than that it stays running. We haven't replaced any major components. Usually it runs 16 hours a day, 5 - 6 days a week. During the end of the quarter, which is push time for us, it will run 24 hours a day, 7 days a week." "When we installed it we just moved everything and kept producing stuff. We stayed on schedule and never shut down production. We get involved with the conveyor very very seldom. FloStor does preventative maintenance. We have guys who watch the conveyor all the time. But what they are watching for is the product, on the conveyor. The conveyor just works. We don't play with it, we don't mess with it. It's become a non-entity, it's just like the lights going on at night, it just happens. Occasionally you have to shut down the conveyor and that affects a lot of people. It's not just that they depend on it, they expect it to be up. It's our lifeblood and it concerned me at first that there wasn't a lot of extra control and double entities that I expected, but it's never been a problem. If we need to replace a part, FloStor is close so if we break it and we can't fix it we call them. We are never down for parts." 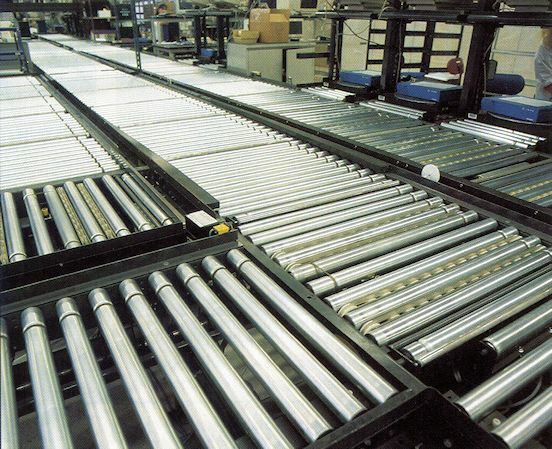 The conveyor system consists of three phases. The first is the assembly and burn-in area. Here the workstations are set up as needed for that computer. As they are completed, on a special pallet, they are transferred to the "main highway", a Hytrol SPA. From here it goes to burn-in via a vertical lift and more SPA. After burn-in it travels back to the "main highway", where final testing takes place, and up a vertical lift to the second (pack out) phase of the system. All transfers are pop-up o-ring type placed in the SPA'S. Phase 2 takes computer to the finished good packing and staging area. SP and incline belts are used here for transportation to the packaging area. 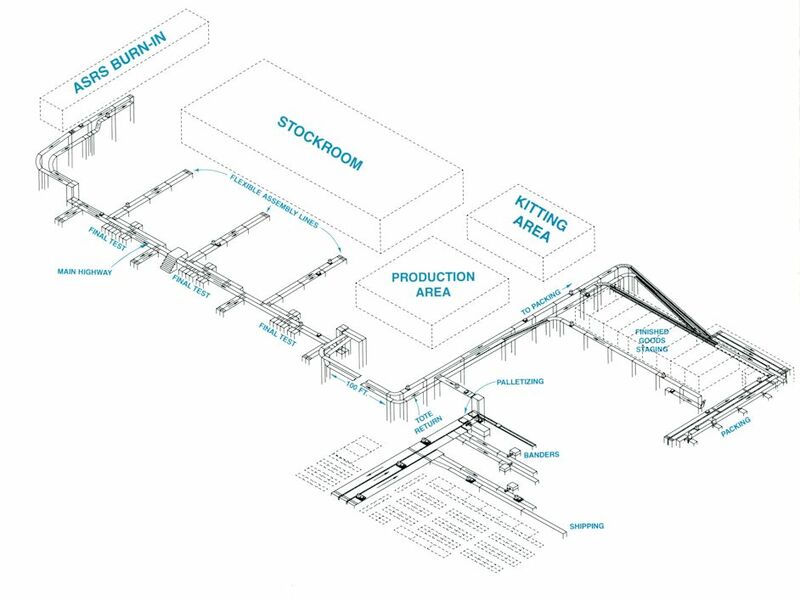 A special holding area is located near the packaging area to store finished product until ready for boxing. Again we use more SPA and pop-up o-ring transfers. 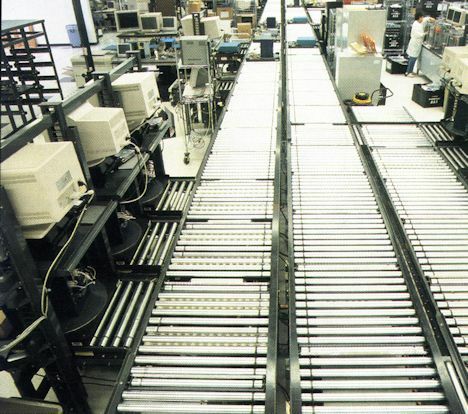 After boxing, the computers are placed on in a large flow rack system. Pallets are returned on another conveyor to the assembly area. In Phase 3, the packaged computers are pulled from the flow rack and placed on a take-away conveyor. This goes overhead and to a vertical lift which drops it down to a loading area where they are placed on a pallet for shipping. Silicon Graphics is a public company that makes state-of-the-art computers used for graphics. They started in 1981 and currently employ over 4,000 people. Most manufacturing is done in Mountain View CA, with plants in Switzerland and Japan. When we installed it we just moved everything and kept producing stuff. We stayed on schedule and never shut down production.